A Classic FJ40 ready for adventure. If you're a fan of those U.S.-spec models from the late 1980s, this will feel like a build that was custom-made just for you. Cloaked in the same steel armor it was born with, and classic details that only a true enthusiast would appreciate, this classic 4x4 is ready to take you back in time! This 1983 model was restored to U.S. specifications with a few minor modifications for comfort and drivability. The Rustic Green paint creates a striking contrast with the Toyota white wheels, and the Saddle vinyl interior - with bucket seats and side-facing benches - finishes off the classic charm. 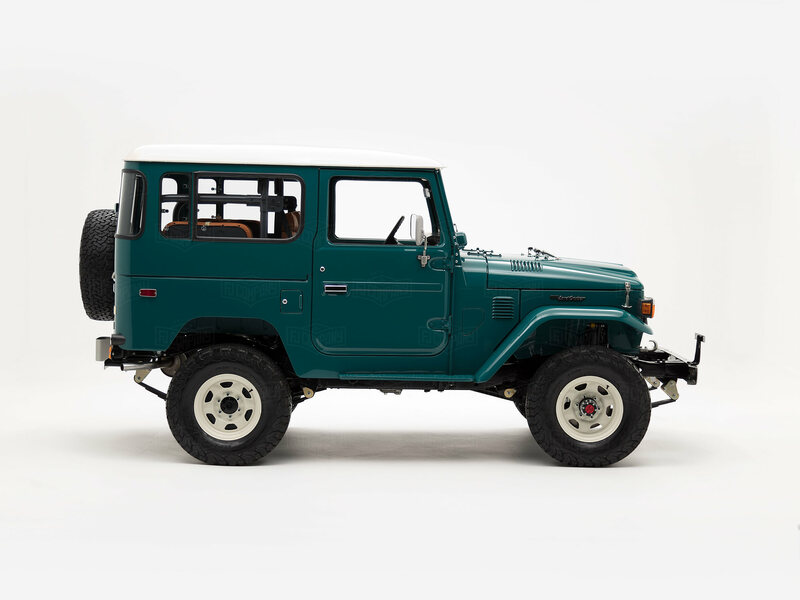 This FJ40 is equipped with a rebuilt classic powertrain and other features that make it ideal for a quick spin around town or a day of off-roading. The Toyota 2F engine was completely rebuilt and mated to the revitalized 4-speed transmission. This FJ40 is equipped with BFGoodrich All-Terrain tires and an upgraded Old Man Emu suspension, which give this classic 4x4 a more comfortable, yet capable ride. This FJ40 is made tough - inside and out. The seats, interior door panels, and the custom center console are trimmed in vinyl for easy maintenance, while the exposed metal dashboard, with its retro knobs and gauges, only adds to this rig's underlying utility. Within the cabin, you'll also find a few modern-day essentials like the digital radio with iPhone and Bluetooth connectivity, and Vintage Air Gen IV climate control.